Jennifer is Player of the Week, this week (and every week) Jennifer shows her team and competitor what true sportsmanship is and and has embodied the Underdog spirit. Her presence electrifies the gym, and it's not just because of the teams safety orange colored jersey, and her matching neon shoes and tall socks. Jennifer encouraged and cheered on her teammates through each play even after the game had been decided. Thanks for your positive attitude and sharing your joy for volleyball with others. Jennifer brought so much energy to the court in tonight's season opener! 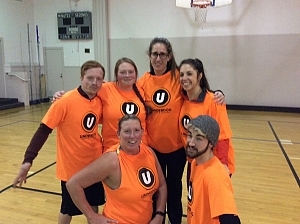 She showed up with a team that hadn't played much volleyball before and was joining Underdog for the first time. They were excited to learn the rules of the game and start playing. Jennifer led the team as their captain and made sure to keep the communication flowing on the court. She did a great job helping her teammates know their positions and the best ways to make power plays, all while dancing and laughing through all three sets. Overall, Spiked Punch had an amazing first game and will be a pleasure to watch this season. Great job Jen and team- keep it up!